Did you ever take a close look at Kol Nidrei, widely considered the most important prayer of Judaism? Read the translation and you might be quite puzzled as to why such a big deal is made out this particular piece of liturgy. It is a simple—albeit strong—statement of annulling vows. Is that the foremost thought on our minds as we enter the synagogue on the eve of the holiest day of the year? After completing his morning prayers aboard the El Al flight en route to Tel Aviv, the elderly European Chassid turned to the American Jew sitting next to him and offered the use of his prayer shawl and tefillin. The problem was that a strong language barrier separated the two. The Chassid spoke only Yiddish and Russian, while our modern Jew was only able to converse in English. Even sign language didn't help facilitate communication between these two very different individuals. Finally, in frustration the Chassid blurted out the following—probably the extent of his English vocabulary: "I Jew—you Jew; I tefillin--you tefillin." There was no need to say another word. The man understood. Sure he'd put on tefillin aboard his first flight to Israel. I love this story because it speaks volumes about the common Jewish spark that each of us possess, regardless of who we are and the extent of our Jewish observance. These two Jews had very little in common; they stemmed from different parts of the world, and didn't even share a common language. Yet, when it came to the Jew within, they connected seamlessly; they were one and the same. Suddenly they understood each other perfectly. In truth, there was no barrier at all. Because after all--"I Jew, You Jew." Another one of my favorites is the story of the poor, jobless man who came to the circus looking for work. The only available position was to fill in for a missing tiger. They gave him a tiger's costume and put him in the cage. All was well until Mr. Lion began strolling in his direction. Petrified, the tiger said what a Jew says when faced with imminent death: Shma Yisrael Ado-noi Elo-henu Ado-noi Echad ("Hear O Israel, G‑d is our G‑d, G‑d is one"). To which the lion answered: Baruch shem kevod malchuto leolam va'ed ("Blessed be the name of the glory of His kingdom forever and ever"--the second verse of the Shema). That's the story of the Jews: On the surface we might look very different from one another. Underneath, we're all the same. The problem is the labels. Every Jew has a label! When it comes to clothing I'd be the first to agree: labels serve an important purpose in helping us choose our preferred selections in terms of style, quality, etc. But who ever heard of labels for Jews? Think about it. What use are these labels to the Jewish people other than to create partitions along denominational lines? Why can't we all just be "Jewish"? Why the need to label ourselves based on our level of observance? It's true some of us are more religiously observant than others. Is that reason to categorically divide us into splintering groups? Let us each observe Judaism and its precepts to the best of our knowledge and ability, without the need of a name tag proclaiming ourselves a particular brand. In addition to dividing us, the labels also limit our growth as Jews. Once we've been labeled, we no longer feel the need to learn more about our heritage than is typical for members of our particular group. Remove the label, and Judaism is yours to explore, completely and freely, without fear you might cross the line and observe some tradition that's not for your type. See my point? If I'm not Religious—Am I a Bad Jew? Perhaps we subconsciously use labels to lower the bar so we can still feel good about ourselves as Jews even if we're not growing Jewishly. The truth is there's no need for that accommodation. G‑d loves us just the same—even if we're not "perfect" Jews. The Lubavitcher Rebbe would always emphasize the value of performing even one single mitzvah (Jewish observance). He repeatedly proclaimed that Judaism is not an all-or-nothing religion as some might have you think ("Either observe all of Torah or don't bother with any of it 'cause you're a 'bad' Jew anyway"). This would be the case if G‑d were a tyrannical dictator whom we needed to placate. In truth, G‑d is a loving father. He asked us to fulfill the mitzvahs, not in quest of power or control, but out of His deep love for each of us—His precious children. With children, it's not perfection you look for. A good parent wants each child to reach their best potential. It's not "all-or-nothing." It's "do-your-best!" A man from the Lubavitch community in Brooklyn once complained to the Rebbe about one of his children who had "left the path" of Torah observance. "I raised all of my children exactly the same way. I can't understand why this one veered away." Replied the Rebbe: "Therein lies the problem. You raised all of your children the same way. But they're not the same. Each child is unique and requires direction and guidance in accordance with his or her individual personality." G‑d is a loving, wise parent who has a personal and unique relationship with each of us. Sure, He'd like us all to "reach for the stars" and try to observe Judaism fully in all of its beauty and depth. But that's for long term. For right now what is most important to G‑d is that we do our best and continue to grow. If we observe one more mitzvah this year than we did last year—we are making G‑d proud! So why the whole fuss around Kol Nidrei? On a deeper, mystical level it is much more than just the annulment of vows and promises. It is a powerful declaration of annulling and invalidating any and all labels, restrictions, demarcations, shackles, barriers and name tags that tend to obscure our sparkling inherent Jewish essence. All of us share one single designer label: JEW! We are one very special, indivisible people; the family of G‑d's chosen nation. Sure, like any good family we have our share of sibling rivalry. But that doesn't change the fact that "I Jew—You Jew." Rabbi Shalom M. Paltiel is executive director of Chabad of Port Washington. Stop worrying about the universe I'm not sure why your obsessing over the age of the universe. Even if you look at Rabbi Shmary Brownstein's response, it's clear that that isn't something which he's majorly concerned about. His concern is that G-d's will, as described to us in our tradition, is done to the best of our ability. From your comment below, it seems that you're dismissing the Torah's authority, making it something you can shape into anything you want, because of science. Which is fine; it's a free country. But someone who regards Torah as having "ignorance" which needs to "adapt" is in no position to tell people how they can be a part of it, that they can have a feel-good conversion and "feel Jewish" without commiting to Jewish practice and be considered Jewish. You can welcome them into your Jewish club, but don't mislead them that they're part of the Jewish people. Would you take medical advice from a doctor who tells you that everything he knows is a lie? To Dr. Manuel Martinez Scientific advances and theories raise interesting questions regarding how they might be reconciled with the Torah. See an article about this here: "How Old is the Universe According to Judaism"
To Shmary Brownstein ". If someone is converted by those who tell him/her that they can be Jewish without the entire Torah, they cannot have entered into the inheritance of the entire Torah, and therefore cannot have become true members of the Jewish people." together we are strong I agree with the author. As any Jew may know, if we were on an airplane, taken by terrorists,, they pick out the Jews,........they are not going to ask how well you know the Torah or how you observe, how often you attend services, no matter what label, the Jews will be together as one, and treated thus, that is the fact. I will always be treated as a Jew. Together we are strong, divided we are weak. We must be strong that is why we are chosen. Thank you for this gorgeous truth so beautifully written and so true. Labels This is a very beautiful, well-crafted essay. I would suggest that there is a reason for experimenting with different approaches to G-d. In the 2,000 years since Torah was written-down in Babylon our Kin have contributed to changing the World in remarkable ways. What would the conversations between Moses and G_D be, if they were conducted today? Have not the past 2,000 years contained changes of such massive significance that the blood of those who gave their lives to write those events cry out for them to be recorded as continuations of G_D's teachings? Is there not a vast difference between cultures that have evolved under (at least in part) the guidance of G_D's Laws, and those that have refused to change their ancient primitive ways? denomonations whilst i agree with the general sense of this sermonette i feel that the "who is a Jew" issue which is at the core of all the division was avoided. Labels/shmabels pro/against I believe we all need to be in one file cabinet. That of Jews or non Jews. On Rhosh Hashonah we pray for attonement/forgiveness and on Yom Kippur it is sealed, as we make our final appeal to the highest court. G_D does not say you are pro abortion, pro euthanasia? He asks us are you Jewish? Are you truly asking for forgiveness or just making an appearance here? We as Jews whether reform, conservative or orthodox all face the one, the almighty. We do not want to be sheperded like cattle, your under 900, your 900-1000, or your over 1000 and therefore categorized. I will stand together with all three grouped labelled and say I AM JEWISH and what are you? "do my best" I had one little problem with the article. In it, you say, "Sure, He'd (G-d) like us all to "reach for the stars" and try to observe Judaism fully in all of its beauty and depth. But that's for long term." 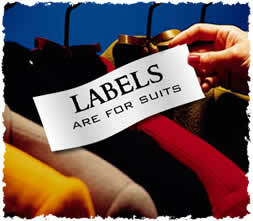 labels I loved your article on removing labels. It is true that the labels that define us often limit our interaction with Jews of a different label and therefore opportunities to grow from one another. In defense of Reform or Secualr Jews, it is quite a generalization to believe that although a Jew does not practice all mitzvohs, that they are also liberal minded across the board.